First Personal Injury is regulated by the Ministry of Justice in respect of regulated claims management activities, the registration is recorded on the website www.claimsregulation.co.uk under Authorisation number CRM28632. First Personal Injury is authorised and regulated by the Solicitors Regulation Authority (SRA) and is subject to the Solicitors Code of Conduct details of which can be found here. 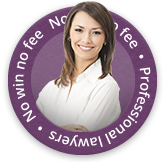 You are free to consult another Solicitor of your choice. Please be aware, the content of this site is for general information purposes only. It does not constitute professional advice (legal or otherwise) and should not be used as such. By using this site, you do not form a contract for services between First Personal Injury and yourself. We take every care to keep the content of our website accurate and up to date but no warranties are expressed or implied. We cannot accept responsibility for actions you may take based on the information contained within this site. At First Personal Injury, we are committed to providing a quality service. A copy of our complaints procedure is available here. If you are not satisfied with our handling of your complaint, you can ask the Legal Ombudsman to consider the complaint by writing to the Legal Ombudsman at PO Box 6806, Wolverhampton, WV1 9WJ, telephoning 0300 555 0333 or e-mailing enquiries@legalombudsman.org.uk. Normally you will need to bring a complaint to the Legal Ombudsman within 6 months of receiving our final written response to your complaint. Our lawyers are regulated by the SRA and subject to the Solicitors Code of Conduct, which can be found here.